Did I mention daughter bought a new budgie a few weeks ago? And here's a vid of Pippin being his delightful self, and discovering how much fun an empty Red Bull can can be! Heh. You'll hear a lot of his wonderful vocabulary, including "Happy happy joy joy," "beautiful boy!" "little Pippin," "Luna," and lots of kissy noises and budgie laughing. I played this while my cats where in front of the speakers and they were looking ALL over for the birds. LoL. I'm glad to finally see another one of your gorgeous budgie videos! I missed these! And this one is particularly sweet! Belle is very cute... and Pippin is great. His vocabulary is perfectly understandable (even for me) and it's so much fun to watch him play. And I love to see how comfortable the budgies are around you. Heh. Stay tuned. Spike is the star of the next one! your pippin is so adhd! i really wish i could make her more tam and playfull... any tips? and you have female and male birds, right? do you keep them seperate? Im thinking about buying another one, so butters will have some company... but I don't know wheter I can put them together without having them mating! The tameness comes from handling - they have to learn to trust you. 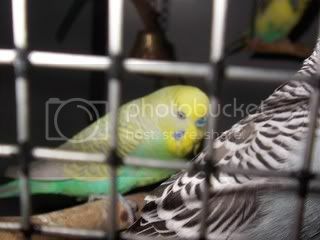 It's definitely easier if you just have one budgie, cos if there's another bird they'd rather talk to them! That said, Luna, our second budgie, copied Pippin (our first), and is even more handle-able than Pippin. But Pippin had been with us for over a year before we got Luna. Once they trust you, they LOVE you and crave your company. All the budgies I've had have been affectionate. It helps with early handling to have their wings clipped too - just so they can't fly our of reach and you don't spend forever chasing them and giving them heart failure. ;~) The feathers grow back really quickly, by which time you hopefully have them tame enough to 'step up' onto your finger and trusting you enough to stay there. You can’t get the smile that is on my face to go away right now. What fun they are to watch. Oh, my word, that made my day - they are so delightful! 24th-Oct-2008 09:09 am (UTC) - Budgies! 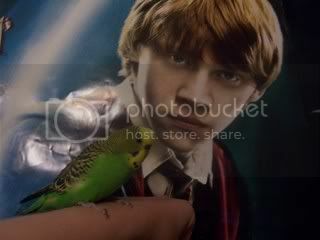 I was so happy to discover that we share a love for Harry Potter and Budgies when I had a look at your page. Belle is very pretty, and the video of Pippin is just adorable. My family have had lots of budgies over the years but our most special friends have been in recent years. We also have an adorable little budgie boy named Ronald, who we hand raised after his mother died. He's about 6 months old and our complete and utter pride and joy :] He lives inside with us and has a love affair with any items associated with food and drink, he always sits on my mum's champagne glass and sips it, and he fell into my dad's cereal this morning! He is almost to the point of talking we think, he imitates the sounds of his bells, the ironing board opening and the coffee machine and he whistles the sounds of 'Hello baby, what you doing?' so it will be very exciting when he starts talking. He looks just like your Pippin too! 24th-Oct-2008 09:44 am (UTC) - Re: Budgies! He does look like Pippin! So sad that his mum died, but great job hand rearing! And Gilderoy looks beautiful too! This page was loaded Apr 21st 2019, 8:28 am GMT.